On the opposite side of the road from The Mansion (see previous page) is the Old Grammar School founded in 1585 and named after the then monarch, Queen Elizabeth I. It was a great honour when, four hundred years later, Queen Elizabeth II visited the school. To the right of the main door are four large mullioned and transomed windows providing natural light for the oak panelled former schoolroom, later the dining room, where the Queen was entertained to lunch on 15 March 1985. She also unveiled a plaque on the exterior wall of what had been the senior boys' day room. Chronological List of known Headmasters & some Second Masters (or ushers) since the early 17th century is lower down this page. "The Free Grammar School of the picturesquely situated market town of Ashborne was founded under Letters Patent, dated 15th July, 1585, of Queen Elizabeth, upon the petition of certain inhabitants and others. Amongst these were Sir Thomas Cokaine (Cockayne) (d. 1592 and buried in St. Oswald's), William Bradbourne of Lee [sic]; Thomas Carter of Middle Temple, gentleman, Thomas Hurte and William Jackson of Ashborne, gentleman, and others. Under these Letters it was to be called "The Free Grammar School of Queen Elizabeth in the village of Ashbourne, in the County of Derby", of which there should be a master, who must be a graduate, and an undermaster. The school was to be governed by three governors and twelve assistants who should form a body corporate with power to sue, purchase or receive lands and other possessions, not exceeding the annual value of £50, and have a common seal. ... Other clauses gave Sir Thomas Cokaine, &c., to grant other lands and property, not exceeding the annual value of £50 ... other revenues to be for the sustenance and maintenance of the school, and the masters who ... were to hold their offices ... for life". The first three governors were Sir Thomas Cokayne (son of the founder), John Alsop (of Alsop en le Dale) and Rev. Robert Hurt. When Her Majesty visited the school in 1985 she met a descendant of Thomas Hurte, one of the original signatories. Her Majesty was also shown the original charter, which was exhibited in a glass case. This Tudor document used to be stored safely in a large chest that was housed at The Mansion. When the web mistress was at the school the headmaster, Donald Kimmins, would display it in the Old School dining room on Founders' Day so that pupils could see it, giving them a great sense of the history of their school. Unfortunately, once The Mansion was sold storage became a problem and the charter is no longer in the hands of the school or the Trust as it now resides in the County Record Office. No statues were made under Queen Elizabeth the First's charter but this was put right on 20th August 1796 when Rules and Statutes were made, under the consent and approbation of the Bishop of Coventry and Lichfield who signed the deed. This followed a letter to him some two years before from the school's governors and assistants, requesting both advice and assistance. They said that the headmaster, William Langley (see list below), had "only one scholar, and had only had two or three for many years past, and that the under-master taught a private school in his own house, and neglected the few scholars that attended the free-school". From this time forward the headmaster or undermaster could be removed if they did not follow the rules. Stephen Glover, in 1833, recorded that the school was open to boys of the parish who could read before admission as free scholars and they would be instructed in the classics, in English History and geography. The schoolroom was in the central part of the building, with the headmaster's house on one side and the second master's home on the other. At that time the school's annual income was £213 15s. 4d. Glover lists the following DONORS in 1796. Philip Okeover, esq. by deed 15th September, 27 Elizabeth, gave a rent charge of 20s. per. annum, out of lands at Mappleton. Humphrey Street, before 1613, had given, at several times, £100 to the school. In 1610, Roger Owfield gave £70. to the school. John Hanson, by will, 13th January 1678, gave a rent of £6 13s. 4d out of tithes of lead ore in the High Peak, now paid by the Duke of Devonshire. Edward Shore and Joan Denton gave 10s. per. annum. George Taylor gave about 2a. of land, near Ashbourn, now let for £5 per annum. Three tenements in Ashbourn, now let for £6 per. annum. The crown public house, in Ashbourn, now let for 10 guineas per annum. Thomas Carter, by deed, 28 Elizabeth, gave a rent charge of 40s. per annum, charged on Mr. William Sutton's house, in Ashbourn market-place. Christopher Pegge, Esq. of Middle Temple, London, by will 12th June 1699, gave to certain trustees, lands, &c., in Ashover and Wingerworth, since exchanged for lands at Brailsford, containing 157a. 0r. 1p. now let for £229 per. annum. Two-fifths of which belong to the school. The farm at Shirebrook, which consists of a house and out-buildings, granted by the governors and assistants to his father and himself, for the term of 21 years, from 6th April then last, at a fair rent of £88 per. annum, the tenant covenanting to keep the buildings in repair. Firth observed in 1908 that "the old school does not seem to have been fortunate in its headmasters", as in 1873, at the end of Rev. Gepp's tenure as headmaster, "the numbers were once again reduced to one". The Ashbourne Local History Group sheds more light on his time at the school as he was suspected of taking private day scholars, resulting in the governors being in dispute with him; it paved the way for a new set of Rules and Statutes in 1852. Both governors and parents also complained about his use of the cane - "zealous" was the tactful word the ALHG used. A new scheme of management was sanctioned by the Charity Commissioners in 1880. Kelly's Directory of 1891 states that "During the past two years a large sum of money has been expended on renovating the fabric of the school and bringing it into harmony with modern requirements. A portion of the front, including one of the carved doorways, had been entirely rebuilt and a classroom had been added.. By 1899 the school had been a district technical school for some years, under the scheme of the Derbyshire County Council. to assist those wishing to cross the road. 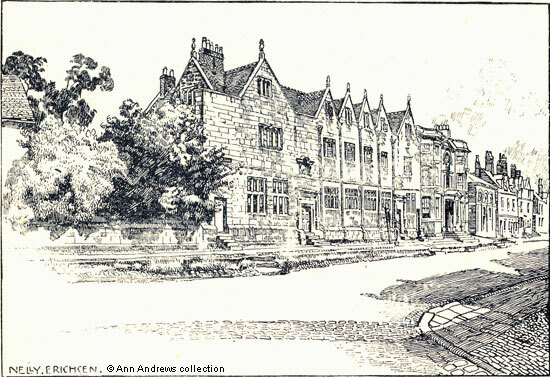 Ashbourne's Old Grammar School is one of the oldest school buildings in the county yet, in 1905, a conference of the school's governors and representatives of Derbyshire Archaeological Society and County Council was held to discuss its future as plans to pull down the ancient building and erect a new school on the site had been drawn up. It had initially been proposed to preserve the front of the building but reconstruct the remainder of the property. The governors had been in favour of finding a new site but had gone along with the Board of Education and County Council. However, the following year it was decided not to extend the old school and plans for a new school were approved. This was built some distance away from the original grammar school, on Green Road, and opened in 1909. It had cost over £10,000 and was now to educate both boys and girls. There are six gables, four smaller ones in the middle and larger ones on either side. lights having arched heads. The wall in the central part of the facade was beginning to bulge. Advertisements before World War One show that boarders were living at the School House during term time. From at least 1916 onwards were still received as boarders at the School House but the Headmaster advised parents of girls who wished to board. The seem to have been under Miss Sutton's care at Langley House. In 1933 boy boarders were "received at the Old Tudor School House. Girl Boarders received at the newly opened house for girls". This was a property called The Ivies, the home of Major Ball and his wife Martha, that was also on Church Street. An advertisement in 1940 was for a "Coeducational Boarding School. Separate Houses, Fine Buildings. Playing Fields and Swimming Bath. 8-18. Inclusive fees 20 guineas per term". Major Ball had installed the open air pool (unheated) behind the house in 1934. He had laid a tennis court behind the Old School the previous year. The Balls were first found at The Mansion in 1946 so presumably this was when the girl boarders moved into that house. In 1947 a notice appeared in the press announcing that "an examination will be conducted at the School on May 7 for limited number of Girl and Boy Boarder Places. Candidates must be in their twelfth year on July 31st 1947". After Queen Elizabeth's was taken over by the County Education Authority its baths had not been used and in 1950 were deemed to be a danger to health unless the Ministry of Health's instructions for water purification were carried out. It was probably the first difficulty Mr. Kimmins had to face following his appointment as headmaster. Another was the renovation of the Old School, which was Grade I listed in 1951. In 1956 the Minister of Education approved expenditure of £18,500 on renovation. The work was to include the removal of initials scraped on the stone by generations of schoolboys and most of the cost was borne by Derbyshire County Council, with £5,000 contributed by the school's Trust Governors. Mr. Kimmins said the building had been a cause for concern for many years as the stone facing was badly decayed. Some of that decay can be seen in the images from the early 1900s on this page. The exterior today shows whiter stones where this restoration work was carried out, although some of the initials carved on the walls were not removed and can still be seen. When the contents of Osmaston Manor were sold in 1961 Mr. Kimmins bought some very fine Grinling Gibbons linen fold panelling for the Old School; it was installed in the main entrance way (through the second doorway from the left as you face the building) by a master and some of the pupils. One of the stories told on dark winter's nights by girl and boy boarders alike was that the ghost of Lady Cockayne, wife of one of the school's founders, walked the length of the junior boys' dormitory on the first floor. In my time at the school no-one mentioned seeing her! Near the end of its time as part of the school boarders were no longer in residence and the building very briefly served as premises for the sixth formers. Unfortunately, this hit a snag and the ancient building was unused for a time. It was eventually sold in 1997 and converted back into three dwellings. Chronological List of known Headmasters & some Second Masters (or ushers) since the early 17th century. This includes various references to them from a variety of sources. Henry Mellor appt, April 1672. George Jackson, appt June 1672. William Hawford, appt Jan 1712. Samuel Burnett, appt March 1712. Rev Burnett was buried at Ashbourne on 17 Jun 1751. John Fitzherbert, appt Feb 1752. William Langley, appt Mar 1752. Firth notes: he held office for 43 years, but when the governors dismissed him he appealed to the Court of Chancery and won. He was forever quarrelling with his ushers (second masters). So much so that they were granted special keys so they could lock themselves in their rooms. He was a friend of Dr. Samuel Johnson, the famous lexicographer, with whom he corresponded. He also showed both Johnson and his biographer James Boswell around the school on one of their visits to Ashbourne. Johnson had once applied for the post of Usher, but was unsuccessful. His will is at TNA. Probate 27 November 1795 (PROB 11/1267/258). Rev. Paul Belcher, M.A. appt 1796 with a salary of about £160 p.a. and a house and garden. 1818 Rev. Thomas Gibbs appointed as under master. Rev. Paul Belcher, headmaster of the free grammar school. Rev. Paul Belcher, M.A., headmaster of the free grammar school. Rev. T. S. Gibbs, assistant. Annual income of the school divided between Rev. Belcher (£142 10s. 2d.) and the remaining one third to undermaster, T. Gibbs. Advertisement for new headmaster, following the death of Rev. Belcher. Required to teach Latin and Greek Tongues and other branches of literature as well as to reside in the school house, with a stipend of about £125, exclusive of the dwelling. All applicants had to be Masters of Arts. Rev Belcher buried Ashbourne 17 Aug 1836, aged 71. By early 1837 the school was "under the superintendence of the Rev. George Edward Gepp, M.A., late fellow of Wadham College, Oxford and assistant master of Harrow School". The boarding fee was 50 guineas per annum exclusive of a charge of four guineas p.a. for washing. It was noted that all boys had a separate bed. Advertisement advising of start of term. Boarding fees supplied by applying to the head, Rev Gepp, with a deduction available for the sons of clergymen. Rev. George Edward Gepp, headmaster. George E Gepp, Clergyman Schoolmaster. Rev. George Edward Gepp, M.A., headmaster of Free Grammar School. Jay Rev Henry, B.A. second master. Rev. Geo. Edward Gepp, M.A., headmaster of Free Grammar School. Charles Henry Bowman B.A. Cr. Ch. Oxford, Master Grammar School. Rev. George Edward Gepp, M.A., Headmaster. Rev. Stephen William Middlemist, second master. Geo. Edwd. Gepp, M.A., Clergyman, Master of the Grammar School*. Rev. Stephen William Middlemist, M.A. of Trinity College Cambridge, Master of Ashborne Grammar School, Incumbent of Okeover, Staffordshire. * Gepp passed away at Limington SOM, where he was the local Rector, on 29 Aug 1881, aged 71. He had been given the benefice by his college - Wadham College, Oxford. HEAD MASTERSHIP of this SCHOOL will become VACANT at Midsummer next, in consequence of the resignation, as from that date, of the Rev. George Edward Gepp, the present Head Master. Gepp was succeeded by Rev Robert Young, who resigned in 1879 (Derby Mercury, 6 August 1884). Rev. A. D. Cope, M.A., appointed and will come into residence at Whitsuntide. Presently Headmaster of Andover Grammar School. "Late Scholar and Exhibitioner", Wadham College, Oxford (Derby Mercury, 1 September 1880). Rev. Davies Cope, M.A., Headmaster. Charles John Millar, B.A. second master. Alfred D Cope was a clergyman without cure of souls. Cope became Headmaster in Mar 1879 but resigned early 1883. He moved away and died in Colchester 28 Dec 1931, aged 86. Richard Maurice Hugh-Jones M.A., of Jesus College, Oxford, Headmaster. Arnold Stoughton Harris B.A. & Philip Edward Martineau. R M H-J became Headmaster "after Christmas" 1883 and was still in post in 1885 (Derby Mercury, 5 August 1885, in a report on the Tercentenary Celebrations), resigning in 1887. There were about 40 pupils in 1884 (Derby Mercury, 6 August). Rev. William Reed, M.A. of St. John's College, Cambridge. Frederick Augustus Fletcher & David Gillmore, B.A., assistant masters, Headmaster. About 40 boys. The census shows 6 boy boarders with ages ranging between 12 and 18. Reed appointed Headmaster at the end of 1887 (Derby Mercury, 28 December). Derbyshire County Council, Technical Instruction Committee. At Ashbourne Grammar School ...  headmaster with scientific qualifications appointed. William James Butcher, B.Sc., F.C.S., Headmaster. Herbert Eric Robson, assistant master. Henry Varley (Lond. Univ.) & Percy H. Steadman, assistant masters. Henry Varley & Charles Rose, assistant masters. 6 boy boarders, aged 10 to 16. William James Butcher, B.Sc., F.C.S., Headmaster (also 1911 census). A. E. Ottoway B.A., William A Wood B.Sc. & Robert Essex B.Sc., assistant masters. Miss Mabel Duckitt B.A. & Miss Olive C. Jenkins, assistant mistresses. Miss Margaret Maskrey, preparatory mistress. Richard Clark Legge, B.Sc. London, appointed from 400 candidates. Death of Mr Butcher at Kings Norton who was Headmaster of the school for about 22 years and had left Ashbourne July 1916. He had reorganised the school to become co-educational in 1909. When he was appointed in 1884 there had been 16 pupils, ten of whom were scholars. When he resigned the number of pupils had reached 100, a testament to his efforts on the school's behalf. After 13 years as its head, Mr. Legge passed away at Buxton whilst playing cricket for Ashbourne. It was said that he "improved and developed the school immensely, and that many scholastic successes and honours gained by the pupils are testimony of the ability and efficiency of himself and his staff (DDT). He was 58 and lived at the Old School House. Mrs. Watson was then the matron and T. A. L. Phillips was housemaster. The school had about 220 pupils in 1928. There were 12 entrance scholarships and 4 leaving scholarships in 1928; the value was £60 per annum and they were for 4 years (Kelly's 1928 Directory). Major Charles F. Ball, B.A. (Lond), senior mathematical master at St Bees School, Cumberland, appointed. Mr. Donald A Kimmins. Announcement by The King's School, Canterbury, that he had left that school to become the headmaster of Ashbourne Grammar School. He and his wife Margot lived at The Mansion and ran the girl's boarding house. Mr. Kimmins retired in 1971. He was succeeded by Mr. John Brocklehurst (1921-99) who retired in 1984. All head teachers since then are still living (2018). Derbyshire's Parishes, 1811, Parishes A, which has more about the town. The Gentleman's Magazine Library, 1731-1868. Ashbourne is mentioned briefly in two sections, though not the old school. mentions Ashbourne in several sections, but mostly under places. 1. 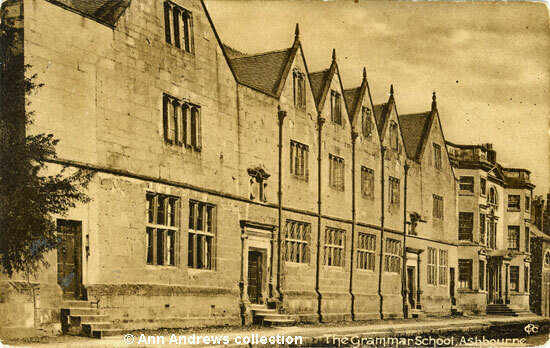 "The Grammar School, Ashbourne". Illustration by Nelly Erichsen, published in J. B. Firth's 1908 book. 2. "Queen Elizabeth's Grammer [sic] School, Ashbourne". Artistic Series, A.P. Co., 9 Bury Court, St. Mary Axe, London, E.C, No.2245. Chromatyped in Saxony. Unused. Other postcards from this publisher date from the first decade of the twentieth century. 3. 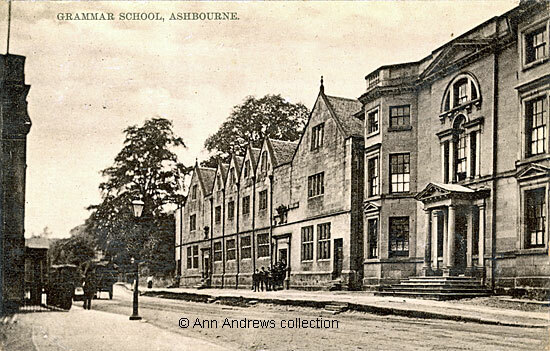 "Grammar School, Ashbourne". "Shaw" Series. Printed in Germany. Posted 8 Jul 1908. 4. 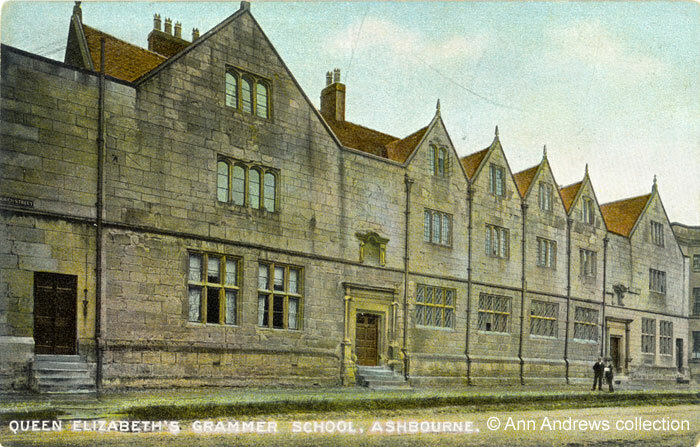 "The Grammar School, Ashbourne". Postcard published by Cotswold Publishing Co Ltd., Wotton-under-Edge, Glos. Posted on 4 Aug 1927 at Ashbourne. Message from a son to his mother, commenting on the glorious weather. Derbyshire Courier, 20 April 1878. Kelly's Directory of the Counties of Derby, Notts, Leicester and Rutland, pub. London (1899). Ashbourne Local History Group (ed. and © Ashbourne Local History Group & Adrian Henstock) 1978) "Early Victorian Country Town", a Portrait of Ashbourne in the Mid Nineteenth Century. ISBN O 9506080 O 9. Derby Mercury, 6 Aug 1884. Kelly's Directory of the Counties of Derby, Notts, Leicester and Rutland, pub. London (May, 1891). Fitton, RS (1989) The Arkwrights, Spinners of Fortune Manchester University Press ISBN 0-7190/2646-6. Derbyshire Advertiser and Journal, 4 Aug 1905. Derbyshire Courier, 7 Oct 1905, and other newspapers. Manchester Courier and Lancashire General Advertiser, 6 November 1906. Derbyshire Advertiser and Journal, 14 Mar 1914. Derbyshire Advertiser and Journal, 1 Nov 1918, 14 Nov 1919, 3 Jan 1920. Derby Daily Telegraph, 16 Sept 1933. "The Ivies", a beautiful brick built Georgian house just along the road from the Old School, had come on the market in 1932, but failed to reach a sensible price and the lot had been withdrawn. Major Ball bought it in 1933, living there with his wife and family as well as a few girl boarders. Charles and Martha Ball were still living at the property at the outbreak of the WW2, although the house name was not given (this from the 1939 Register on FindMyPast). Derby Daily Telegraph, 6 Jan 1940. Derby Daily Telegraph, 14 April 1947. Derby Daily Telegraph, 28 June 1950. Birmingham Daily Post, 30 July 1956. The Times, Friday, 19 Oct 1956.